It's not very often when you click on the list of offensive leaders on the NCAA database and see a player from UConn near the top of the list. Yet, two weeks into the season Noel Thomas is tied for third among FBS players with 20 receptions. That reception total, if it came at the end of the season, would have ranked in the top five at UConn in six of the last eight seasons. Off the subject, it should be noted that Bryant Shirreffs is third nationally with a completion percentage of 79.6. As I mentioned in the story I wrote on Thomas for today's Register, there are 96 FBS players with at least 10 catches this season and Thomas is the only one to account for 50 percent of his team's receptions. It got me to wondering where his numbers through two games would rank in UConn history. According to my research, Thomas broke Mark Didio's record of 16 catches through two games which was set in 1989 and matched two years later. Some of my research came back in 2013 when Shakim Phillips got off to a blistering start so I can't recall if I went back to the pre-Mark Didio days but the only player in the top 10 on UConn's season receiving mark is Keith Hugger, who had 57 receptions during the 1981 season so my apologies if he should be on this list. I certainly do not expect Thomas to end the season averaging 10 catches per game. There were some encouraging signs in the fourth quarter against Navy as sophomore receivers Hergy Mayala and Aaron McLean combined for 80 yards on four catches. I didn't have the space to include Thomas' thoughts on the development of the younger UConn receivers but here's what he said. "It definitely is big for those guys," Thomas said. "The play Aaron made, I wasn't even on the field so that was a hell of a play by him. Hergy, (five catches) for 68 (yards) I believe, that is his career high and it is just going to get better from here. Aaron had two plays in the game (counting a memorable block) and both were highlights so that is awesome. It is huge because it shows the selflessness to go out there in the game and make a block then to not play until the last drive and come up big, that is awesome to see." 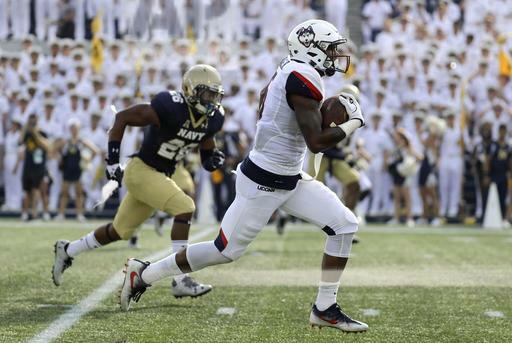 As I mentioned in today's story, Thomas also became the 18th UConn receiver with 100 career catches during the fourth quarter of the loss to Navy but just the sixth to accomplish the feat during the FBS era (Keron Henry and Shaun Feldeisen hit triple digits but played some of their career before UConn made the jump).